What is a “Switch Environment Assessment Tool”? People from a medical background e.g., Clinicians and Assistive Technology Professionals. Therapists e.g., Speech Therapists, Occupational Therapists and Physiotherapists. Why do I need SEAT? When prescribing switch accessed assistive technology a number of attributes such as ‘Hold Down Time’ (that is the time the switch must be pressed before it is seen by the application to be a genuine switch closure) and ‘Scan Duration’ etc., require values. These values in the past have been obtained through previous knowledge and / or trial-and-error methods. However, with the user completing tests and SEAT undertaking the analysis of the results of these tests, similar values for these settings should be obtained regardless of the perscribers knowledge. In addition, each test was designed to take the minimal time to obtain the maximum information about the user’s abilities. 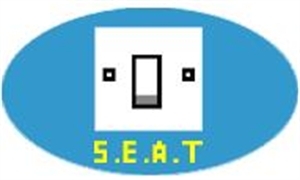 SEAT provides a total of seven tests, each of which gains more information about the users preferences and abilities. You do not have to use all the tests and can opt to use only the tests which will give you the values you require but it is important to note that some results do influence others. What if I want to keep additional information about the user when undertaking the tests? SEAT contains a window which lets you enter additional information that may have influenced the tests. For example, size of the screen and user’s viewing distance. This is particularly useful if the same user undergoes the tests at different times and the results vary due to other factors, which hopefully have been recorded within this information. What if the user finds reading difficult? In addition, to all of the instructions being given in a text format the default is to have them also spoken. However, both of these can be turned off and then the administrator explains what the user is required to do. What information and formats can I see the results in? The SEAT application will let you display the results from each of the tests undertaken and the information you have collected about the user. All of this information can be displayed on the screen of the computer or saved in the formats of comma delimited and Word document. The comma delimited enables you to pull the information into ‘Excel’ or a ‘Database’, letting you do additional analysis of your own.